Anthony Brichta’s background doesn’t suggest that he would spend all of his free time in an old truck factory, distilling spirits where commercial vehicles were once made. He doesn’t come from a long line of bootleggers, moonshiners or mechanics. Rather, Anthony is an attorney-turned-distiller. He moved back to his hometown of Allentown, PA to pursue a dream of producing high-quality spirits while also being a part of the revival of the rustbelt town that raised him. Like many distillers, Anthony first had the idea to start his own operation while visiting another craft distillery. On a visit to Brooklyn, NY, he and his friends stopped by the Kings County Distillery for a tour. Upon seeing what was being done in Brooklyn, Anthony wanted a spirit to call his own. As he describes it, he wanted to build something and be responsible for his own success. He wanted to be the one out there, finding customers and opening markets. County Seat Spirits, named for Allentown’s position as the county seat of Lehigh County, fired up its stills in the fall of 2014. With that, Anthony, together with his partner, John Rowe, had a product that was entirely their responsibility. Anthony decided to take his passion project one step further, by moving back to Allentown, PA and reconnecting with his roots. He wanted his distillery to mean something to the community and not just himself. As such, he took over a space in a former truck manufacturing plant that the city had turned into a small business incubator. The truck plant used to be an economic engine for the town and, when it left, many jobs did as well. Anthony hopes that, in partnership with other craft artisans, this space will become a new source for growth in Allentown. Luckily for Anthony, the facility already housed a brewery and a meadery, so his craft distillery fit in nicely. Now, visitors can stop by and get a full range of liquor experiences simply by walking door to door. It’s the kind of synergy that’s required for a new industry to become successful. 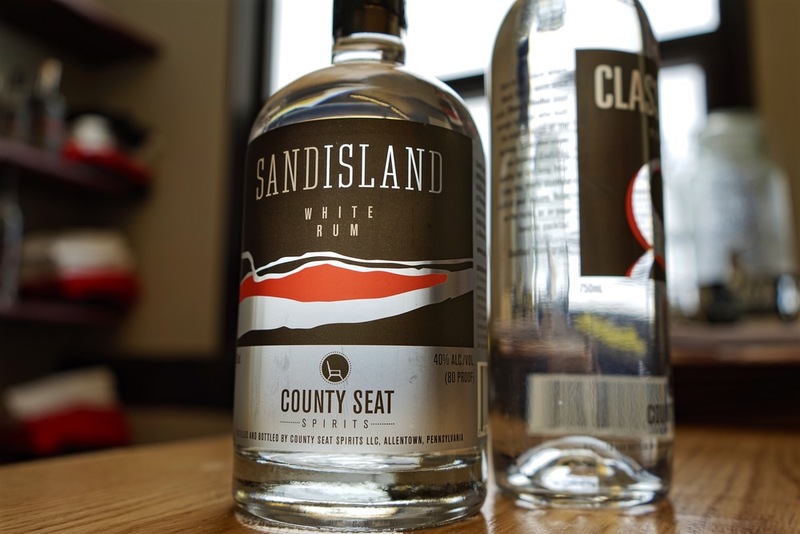 County Seat is building out a full line of distilled spirits. Its first two products on the market include vodka and rum. It has a heavily wheated bourbon in barrels and is working to perfect its gin recipe. Tying the products even closer to Allentown, each spirit is named after an important local landmark. Class 8 Vodka is named after the vehicle class formerly manufactured in County Seat’s building. Sand Island Rum is named after a park on the nearby Lehigh River. Hidden Copper Bourbon takes it’s name from the brief stay that the Liberty Bell made in Allentown during the American War for Independence. Lock Keeper Gin is named for the neighboring city of Easton and the locks that allowed vessels to move along the river. Pennsylvania gave Anthony more than just a home, a manufacturing space, and good names for his spirits. The spirits reside in glass bottles from an in-state manufacturer. The grains (except for the distiller’s malt) that Anthony mills in-house come from Lancaster, PA. When the spent grains are removed from his distillery, they go back to another local farmer. His label designer can be found in Doylestown, PA. County Seat Spirits is a local, artisan company and it is apparent throughout nearly every aspect of production. How to summarize a bold endeavor like County Seat? It is the result of a dedicated team that wanted to make something for themselves and also celebrate their history. It is a bold experiment in bringing a new kind of industry to a region still suffering from industrial closures decades ago. It is the bold belief that a locality can provide nearly everything, only requiring someone with the desire to put it all together. For Anthony Brichta and County Seat Spirits, the ingredients are all there, the desire is there, and now it is on he and his partner to see it through to success.